Nan and I took Nazario and his son Aldo sailing on the Saturday after we returned to El Milagro Marina from the boatyard. There was a brisk ten to fifteen knot breeze blowing from the south, and the sky was filled with puffy cumulus clouds. 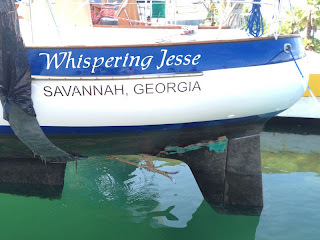 It was a perfect day to get out on the cool blue waters between Isla Mujeres and Cancun, and a good opportunity to see how Whispering Jesse would perform after the repair work on her skeg, which had kept us from sailing since we arrived here in late May. We threw off the lines at 10:30, with the idea of sailing all the way around the island. We motored out of the bay, past the two red buoys that mark its entrance channel, and aimed for the distinctive Gran Puerto building over in Puerto Juarez. The water just past where the island's peninsula juts out is shallow and features a sandy bottom, which makes the water appear a brilliant aquamarine, like what you imagine the person who came up with swimming pool paint was trying but failing to achieve. Once we reached double-digit depth, I turned us south into the wind and we raised the mainsail. Nazario and Aldo both speak very good English, so communication was not an issue. 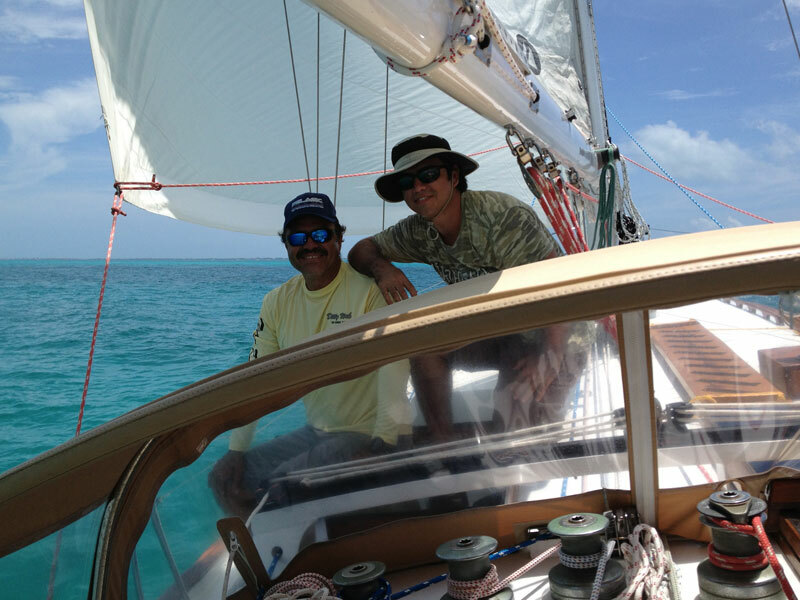 We fell off the wind toward Cancun and unfurled the jib. I had Nazario slide the fairlead aft and then I opened the lifeline gate so we could sheet the jib in tightly. Otherwise, the sheet puts excessive pressure on the lifelines and stanchions. We took a bead on the new hotel over in Cancun's Hotel Zone that looks like it has a hole in it and tightened the sheets for a fast close reach. On a whim, we also unfurled the staysail, for the true cutter (two headsails) effect. 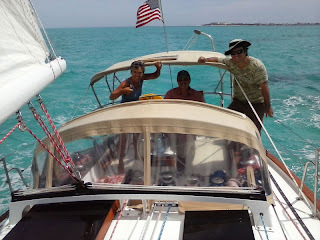 At six to seven knots, we were heeling a little beyond comfort, so we slid the traveler leeward to flatten the ride. 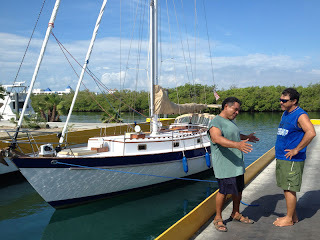 Nazario and Aldo, who are very experienced with fishing boats but not so much with sailboats, were smiling broadly. They commented that it seemed like we were going much faster than we actually were. There is a large red buoy that marks the southwest corner of the shallow water at Punta Sur, the southern point of Isla Mujeres. We furled the staysail and then tacked when the buoy was off our beam. We were adjusted for our new heading before I realized it would take us another couple of tacks to clear the island's south end. We had been out for over an hour at this point and it was going to take a few more hours to get all the way around, so I asked if we shouldn't maybe think about heading back instead. The others agreed, and we jibed to follow a heading right up the island's beautiful western coast, with its many beaches and impressive villas. Coming back into the bay, the boat traffic was intense, causing greater wave action than we had experienced outside it. 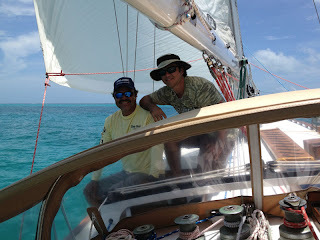 We furled the jib, dropped the mainsail, and followed the red buoys back in. As we approached El Milagro Marina, we dodged other boats while looking for an opportunity to turn to starboard in order to set up for a reverse entry and a stern-to tie-up. Soon we were standing on the pier in the hot sun drinking ice-cold Modelos. When Nan asked him what he thought of the experience, Aldo said with a smile, "Now I want a sailboat." 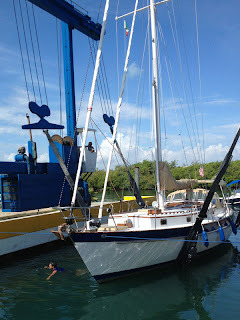 Last Thursday afternoon when we stopped at the boatyard, there were all kinds of work going on. 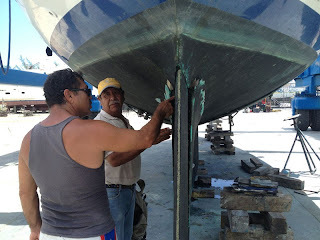 Roberto was finishing up the skeg repair, his assistant was buffing out the touch-up paint on the cosmetic gelcoat repairs, and the boatyard men were applying the first coat of bottom paint to the hull. All assured us that the boat would be ready to go the next morning. To be certain they hadn't missed anything, Nan and I walked slowly around the boat, looking closely at every surface. The first thing we noticed was that the white and blue paint that had looked like a near-perfect match when it was wet at the paint store was not so perfect when it dried. The white was a little too yellow, and the blue was a little too bright. From a distance you couldn't tell, but up close the margins were easy to distinguish. For what we paid, I can't complain. I would much rather look at slightly mismatched paint than at the scars where our Aries windvane was. Early Friday morning, Nan and I walked to the boatyard instead of riding our folding bikes. Nazario met us there shortly afterward. The boat was already up in the lift when we arrived. 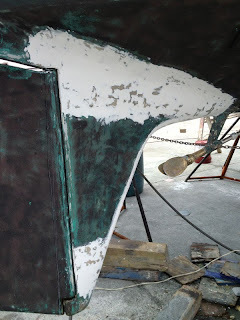 The boatyard men were cleaning up the bottom of the keel before painting it and the patches where the supports were. When they were finished, the boat looked almost brand new, buffed and shiny above the waterline and deep black below. A ladder was placed against the rail, and Nazario and I climbed aboard for the slow ride over to the haul-out basin. 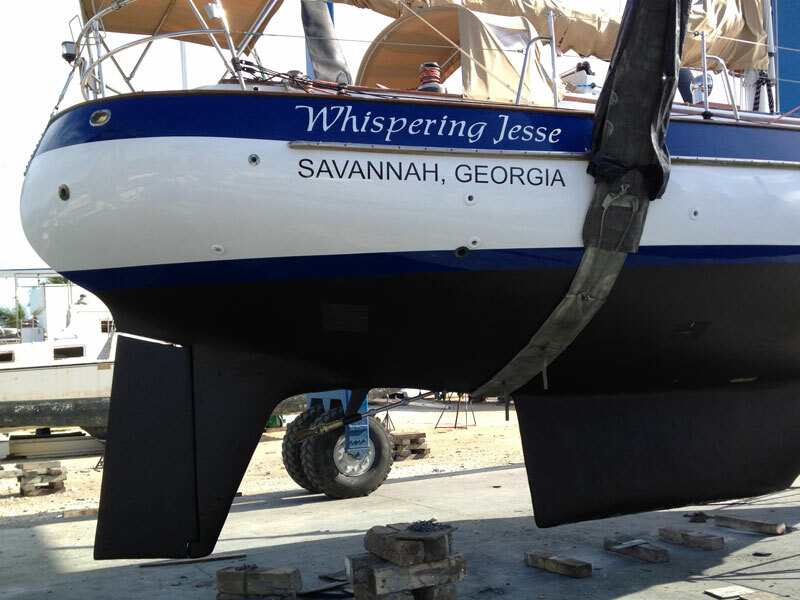 We used the time to rig up fenders and dock lines. Once we were afloat and the lifting straps were released, we tossed the lines and pulled the boat over to pick up Nan. I fired up the engine and backed us out into the channel, put the transmission into forward, and motored toward El Milagro Marina. Whispering Jesse felt good and right again. Roberto got right to work the next morning, Friday, arriving at the boatyard with a milk crate full of tools. Nan and I were waiting there to give him the second 1,000 pesos he had requested as a deposit. He thanked us and pulled out his rotary sander. We told him we would return later to see how it was going and pedaled away on our folding bikes. When we returned, Roberto was at the entrance gate signing out with the security guard. He walked with us back to the boat and showed us how he had cleaned up all the ragged edges on the skeg shells and on the skeg itself. 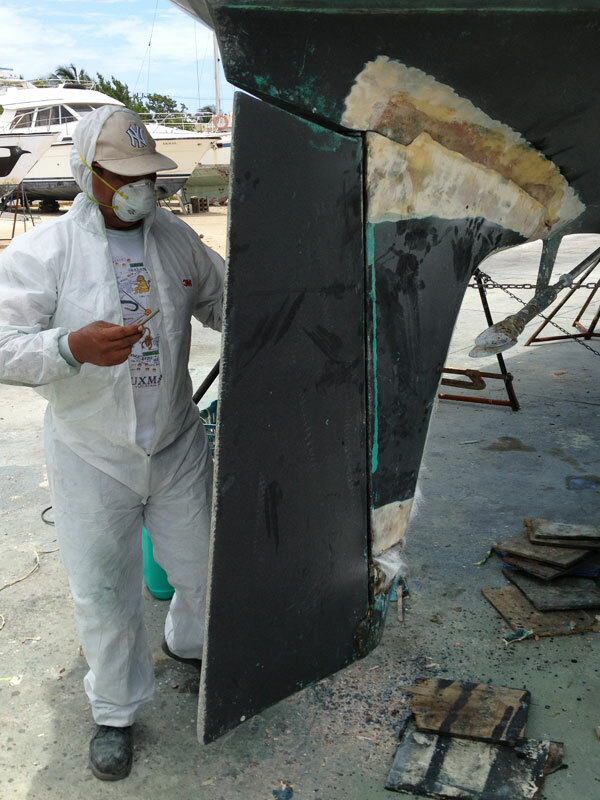 He told us he would be back on Saturday to begin the fiberglassing. 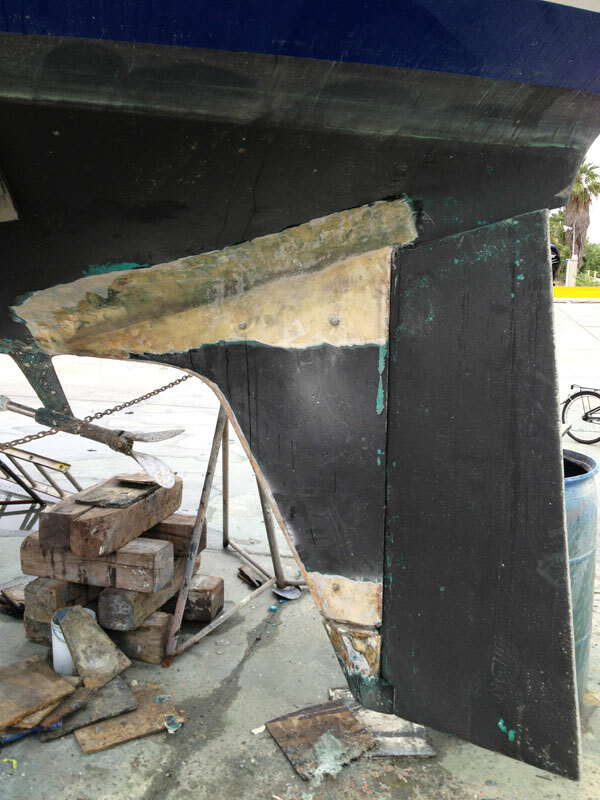 The photos show the progression of Roberto's fiberglass work on the skeg over the next few days. While we were at it, we also contracted with him to repair and paint the scars left by the removal of our old Aries windvane, as well as numerous hull scratches from past docking mishaps, for an additional 3,000 pesos. there, I noticed that a gallon of Pettit bottom paint was priced at 4,350 pesos. I did the conversion, and it worked out to $362.00! Nazario said it was so expensive because it was so heavy to ship from the United States. (A gallon of water weighs a little over eight pounds, but a gallon of bottom paint weighs at least twice that because of all the growth-inhibiting metals it contains.) We had worked out the details with the boatyard to have them paint the bottom after Roberto finished, but I didn't expect the necessary three gallons to cost over a thousand dollars. Nazario suggested that we use Mexican bottom paint instead and drove us over to Nervion Pinturas, which seemed an appropriate name as the fumes inside the store were enough to cause nerve damage. We took three gallons of black Nervion bottom paint to the counter, along with three liters of solvent. Then Nazario went back and forth with the paint-mixing man in rapid Spanish to see about getting quarter-liters of touch-up paint, matched as closely as possible to the Awl Grip paint sample sheet I had brought along. Whispering Jesse's "Snow White" and "Royal Blue" were not easy matches, and it took several minutes for the man to mix close colors. Nan and I were getting headaches from the paint fumes by then and wondering why the large ventilation hood above the counter was not running at full blast. 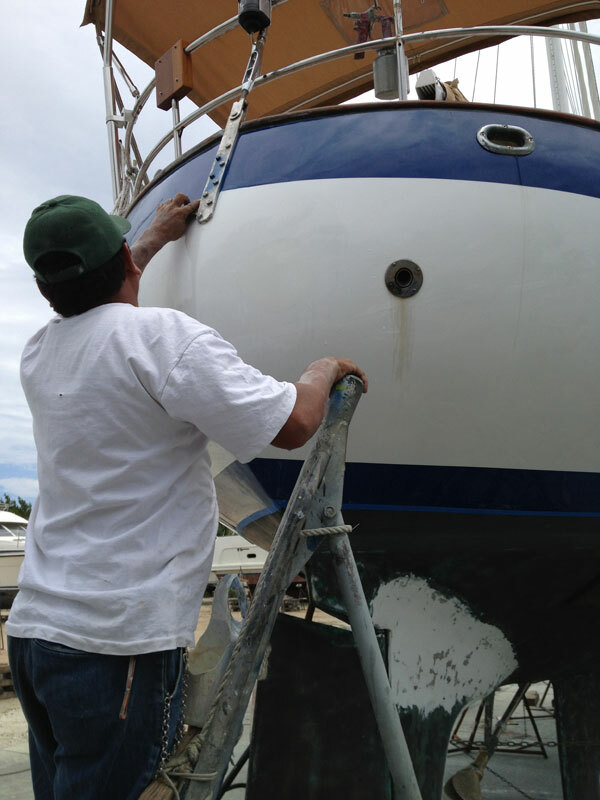 With a trunk full of very heavy paint, Nazario drove us to the ferry dock for the ride back to Isla Mujeres. We thanked him profusely for his help and offered him money to at least pay for his gas, but he would not take it. He is a very good man and we appreciate him tremendously. 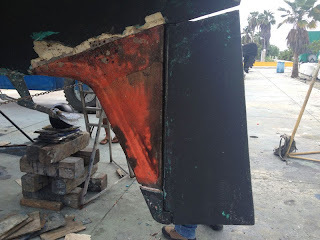 We were finally able to coordinate getting the boat hauled out and the fiberglass repair on our damaged skeg started. It took scheduling the lift at the boatyard, finding a reliable fiberglass repair person, and locating lodging for the duration of the work. 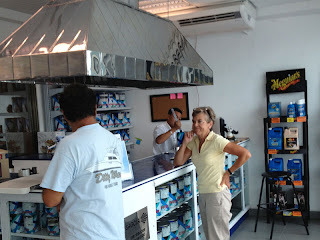 It all came together for us on Thursday morning, thanks in large part to the friends we have made here in Isla Mujeres. Nazario, the captain of Ditty Wah, the beautiful sport fishing boat in the slip next to Whispering Jesse, speaks excellent English. He also knows Louis Fernando, the boatyard manager at Puerto Isla Mujeres, and he contacted him on our behalf to get an estimate on the haul-out. Teresa and Louis, who own the Color de Verano apartments where we have stayed many times, have used Roberto, a fiberglass expert from Cancun, for work on their own sailboat. Roberto speaks no English, but Teresa contacted him for us and set up an appointment for him to meet us at the boatyard on Thursday afternoon. Eric, the owner of El Milagro Marina, let us apply a trade that we had worked out for a magazine article I am writing about the marina to lodging in one of his studio units. We needed a place to stay because the boatyard does not permit people to live aboard their boats while they are there being worked on. Early yesterday morning, Nan and I packed up the clothing, computers and other items we would need and put them in the marina's office for safekeeping until we could check in to the studio in the afternoon. 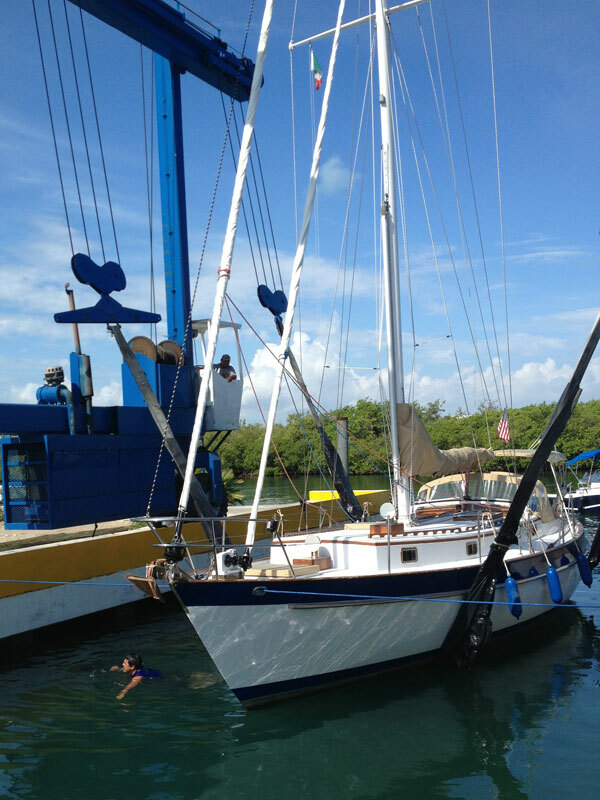 We removed the awning, hatch-mounted air conditioner, and other equipment from the deck and prepared for departure. Nazario and Felix, the marina's resident handyman, showed up on the pier just before nine o'clock to assist with the dock lines. I fired up the engine and we shoved off, motoring very slowly toward Puerto Isla Mujeres, located on the channel that connects Isla Mujeres's bay to Laguna Makax. We were met by two boatyard workers at the haul-out basin, and a third drove the lift over. 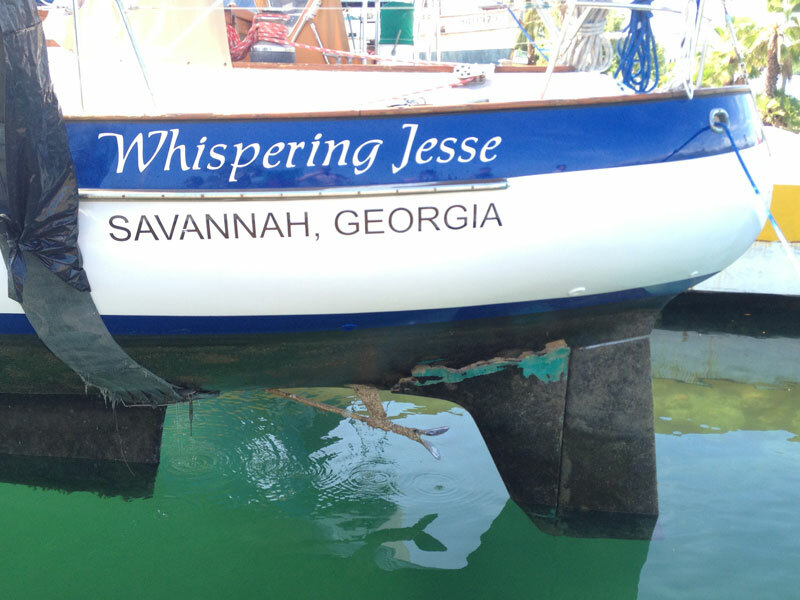 Nazario jumped in the water to ensure that the slings were placed correctly under the hull, and then Whispering Jesse was slowly on her way up and out of the water. There was a round of exclamations as the damaged skeg came into view. The broken skeg shells remained in place, even after the hull was power washed, but they were hanging on only where they joined the bottom of the rudder. Roberto had agreed to see us at one o'clock, and Nazario was kind enough to return to the boatyard to speak with him for us. 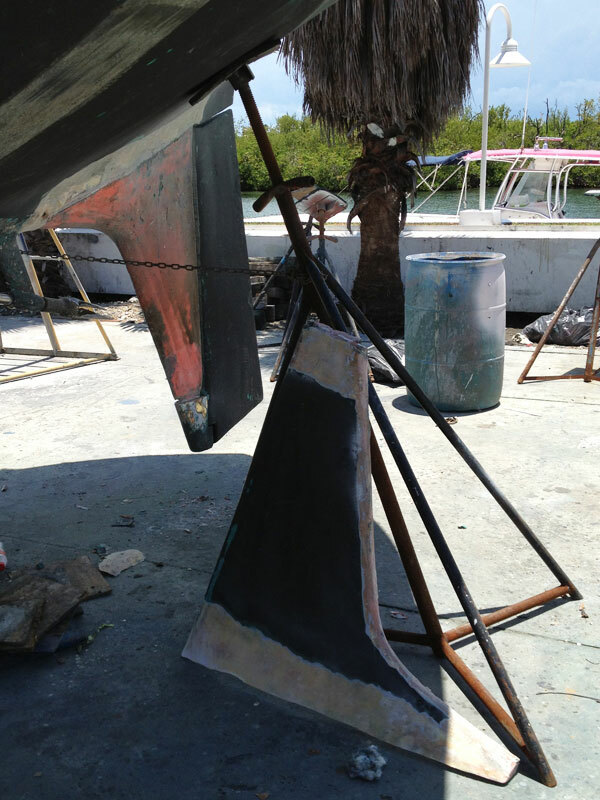 While the two spoke in rapid Spanish, Roberto evaluated the damage, pulled a hammer and chisel out of his tool bag, and pounded a horizontal crease into the bottom of each skeg shell. 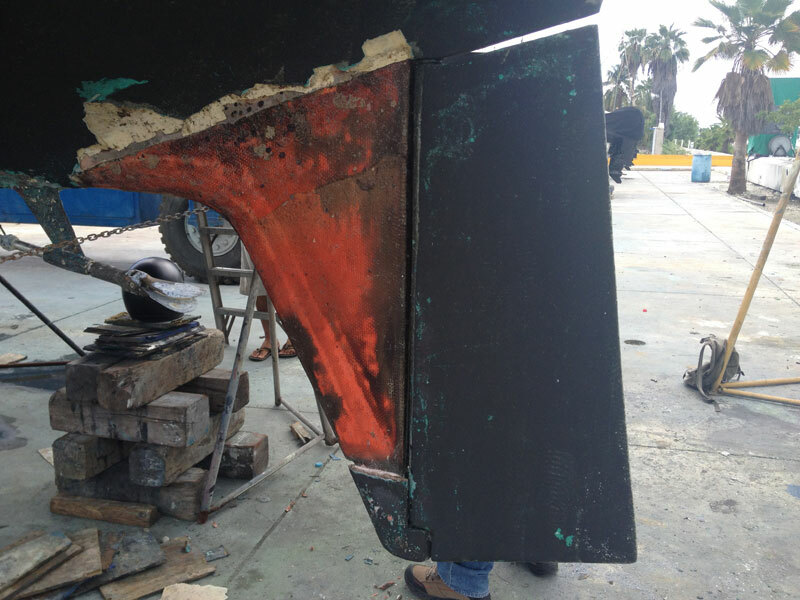 He then levered them both off, exposing the raw structural fiberglass beneath. We had not even discussed a price yet, but there was no turning back now. Roberto made some mental calculations and then spoke rapidly with Nazario again. Nazario pointed at the skeg and asked several questions, then turned to Nan and me and said that Roberto would fix the skeg for 9,000 pesos. I pulled out my iPhone to do the monetary conversion using the calculator app. It worked out to about $750, which seemed like a very good deal. We shook hands on it. Roberto then requested 2,000 pesos in advance, but we had only 1,000 with us. We promised to return with the difference the next morning, when he would begin the work. Nan and I pedaled back to El Milagro on our folding bikes confident that we were in good hands with Roberto. We thanked Nazario and Felix profusely and gave them gifts of beer and cash to let them know how much we appreciated their help. A few days after Nan returned from her visit home to Manitowoc, Wisconsin to see her mother, I left Isla Mujeres, Mexico (after two more trips to Immigration for the necessary paperwork) to travel to San Diego for a family get-together celebrating my father's eightieth birthday. Nan graciously stayed behind to look after the boat, and it's good that she did because she has reported daily rain and high winds. My sisters Susan and Jane coordinated the rental of a large home in the hills of La Jolla, with great views to the north toward the San Bernardino Mountains. We have been mostly hanging out at the house because it has been difficult to coordinate twelve people going anywhere in three small rental cars, especially when nobody can agree on where to go. We did all agree to go to the La Jolla Cove beach area on Monday to see the surfers and the sea lions. Brother Stuart was the only one to take a swim and he reported that the water was a brisk 72 degrees or so. 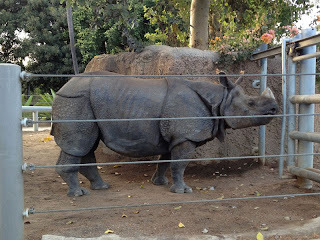 On Wednesday, a group of us went to the San Diego Zoo. Growing up in Milwaukee, I always thought Milwaukee's zoo was the best, but it doesn't compare to San Diego's, partly because of the difference in climates. 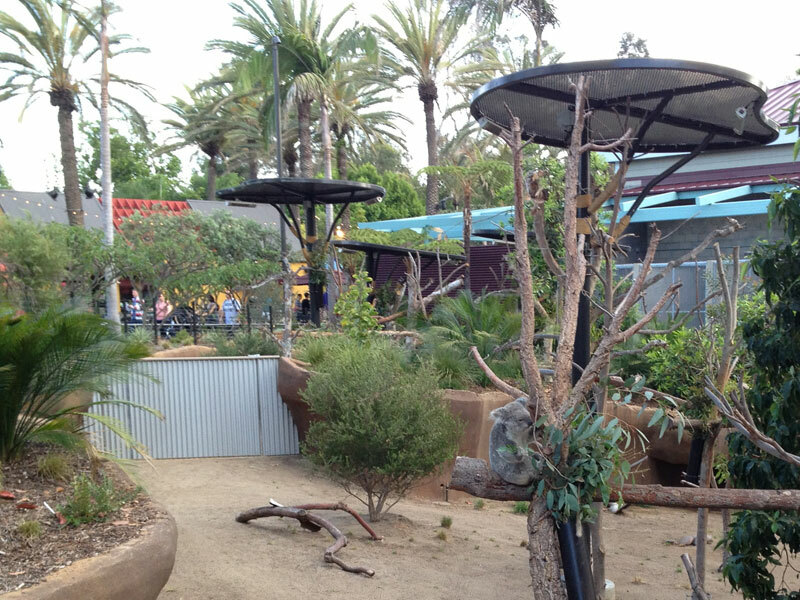 Milwaukee's harsh winters prevent the growth of the lush tropical vegetation that is so abundant at the San Diego Zoo. We were there in the late afternoon, at feeding time, and the animals were active. We watched the big cats and the rhinoceros pace around in anticipation of dinner. The koalas woke from their naps and munched on the eucalyptus shoots that were waiting for them. We would have seen the pandas and their new cub but the line was a half-hour long. Some in our group were able to spot them later from the aerial tram we took at the end of the day. On Thursday, Independence Day, another group of us went to Old Town San Diego. 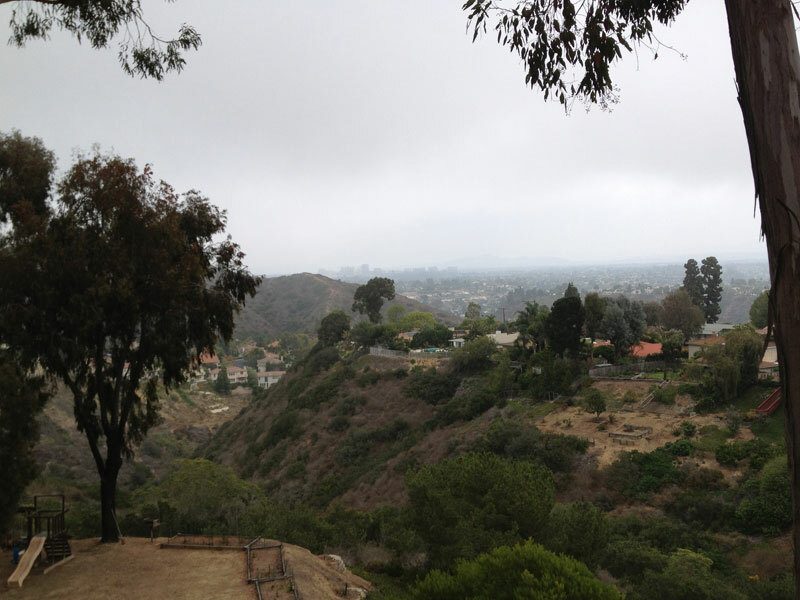 I had not realized that it even existed, but the people of San Diego have done a remarkable job in preserving the original site of the city's settlement. We toured the buildings that housed the first settlers but are now excellent museums. We watched the Fourth of July parade around the Old Town square featuring descendants in period clothing. And we jumped at the boom of an historic cannon firing. Friday, our last full day, was another beach day. We all drove up to Encinitas and spent the afternoon at Sea Cliff County Park. The nephews tried to body surf in the small waves, and Stuart again went for a long swim. The rest of us were content to sit in the sand and watch the surfers.